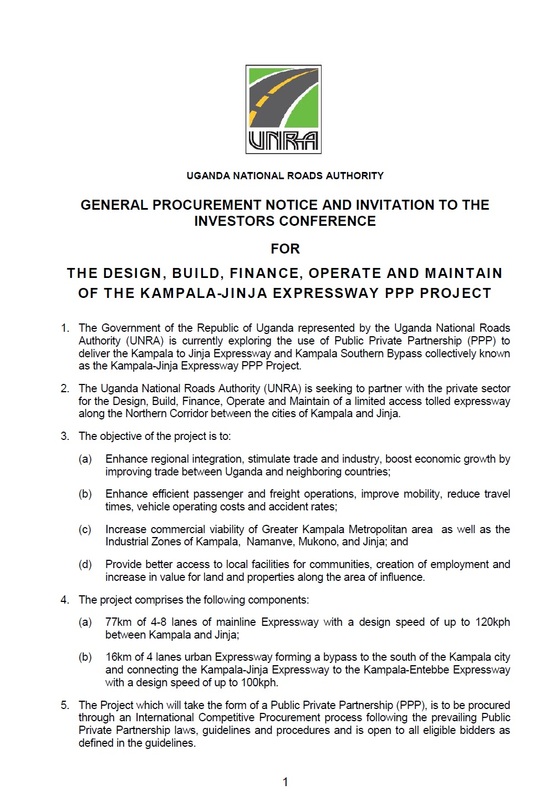 Today UNRA put out a tender for the KJE or Kampala – Jinja Expressway. That will be a Public-Private Partnership, which means that the government project will be financially funding through the investors that will get back on their investment through the tolling of the commuters and traffic on the road after building the project/road. UNRA has the official follow-up of the KJE and will oversee that the company or companies that they keeps up with the set standards. Though it worrying to see how the numbers has gone up for the project from $ 0,5USD Billion in 2013 to Ministry of Transport set the contract for $ 1USD Billion on the same project. Here is the main quotes from different sources and I myself wonder if this in the re-up for a similar “Project 1034: Mukono-Katosi Road Scandal” with Corruption and also bad practices with financial issues since they did not follow “due diligence” on the contracts on that. But let’s hope, here is what that is out there now. IMF reports in 2013 saying that the cost of the project would be $ 0,5USD Billions, that funding aren’t made with government money, but through PPP funding. This is all a part of the main issues which is this: “An additional investment of $200 million on the needed connectivity (e.g. roads, bridges) for the start of oil production in 2018 is also anticipated” (…)”Roads. The program mainly includes construction of roads linking Kampala with Jinja and with Mpigi, expected to start in FY2013/14 and be completed in five years at a cost of about $500 million each” (IMF, 2013). “According to the Uganda National Roads Authority (UNRA) spokesperson Dan Alinange, the government has hired the World Bank’s International Finance (IFC) as advisor to help in the tender process” (…)”The six-lane, 77km Kampala-Jinja road will be the first PPP road project in Uganda and the second toll road in the country after the $470m Kampala-Entebbe road that is currently under construction” (…)”Alinange added: “We want to reduce congestion on this corridor for Uganda. We are aware there is enormous appetite for this sort of project and that’s what gave us confidence to structure Jinja-Kampala as a PPP” (RTT, 2014). “The project involves the development of a six-lane 77-km road project. The project aims to improve road infrastructure in Uganda, improve road safety and facilitate trade and tourism. The project will be developed on a design, build, finance and operation (DBFO) basis. The total project investment is estimated at around US$1 billion” (Martin, 2014). “One of the roads is the Kampala-Jinja expressway estimated at about $800m (about sh2.13 trillion). The new road will help decongest the old Kampala-Jinja road that forms part of the Trans-African highway” (…)”Construction of the 80km state-of-the-art road is expected to commence in 2015. About sh200b has been earmarked for compensation of the affected people” (…)Eng. David Luyimbazi said: “The investor will recover the money through charging a toll fee from road users over a 20- 25-year concessional period.” (Ogwang). “In 2011, PPIAF provided follow-up support to identify and prioritize potential PPP projects. Ten priority projects were identified, including the Kampala-Jinja road, which is now under implementation with the International Finance Corporation (IFC) appointed as the transaction advisor” (…)”In May 2014, IFC’s Advisory Services in PPPs signed an advisory agreement with the GOU, through the UNRA, to develop a 77 km greenfield expressway between Kampala and Jinja” (World Bank, 2015). “One of the priority projects – Kampala-Jinja – road is now under implementation with IFC appointed as the transaction advisor. 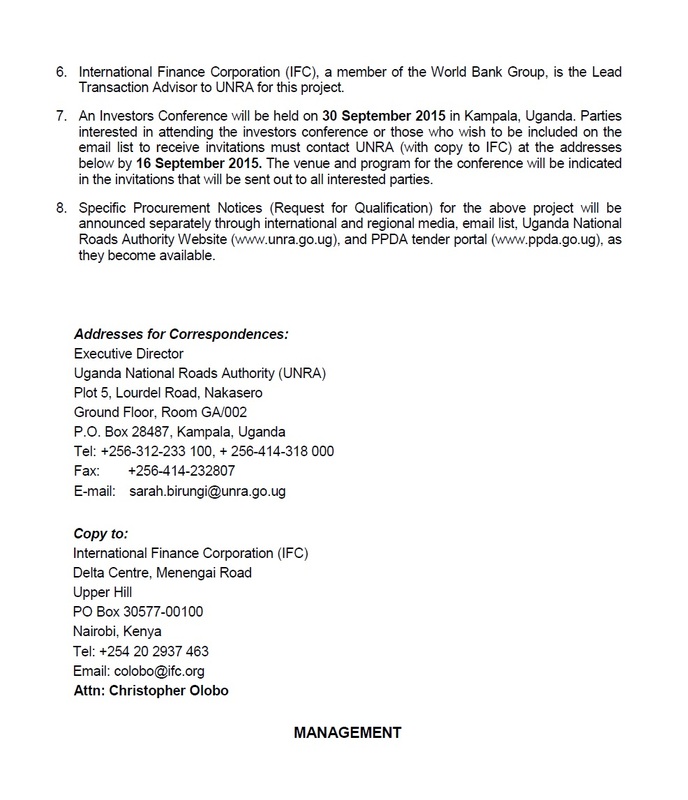 PPIAF recently approved a grant in partnership with Trademark EA (TMEA) and IFC to support two main tasks: the development of a tolling policy and an investment appraisal guidance tool, and strengthening the Uganda National Roads Authority (UNRA’s) capacity to implement PPP projects” (…)“In May 2014, IFC’s Advisory Services in PPPs signed an advisory agreement with the GOU, through the UNRA, to develop a 77 km greenfi eld expressway between Kampala and Jinja with a possible extension to include the 17 km Kampala Southern Bypass. 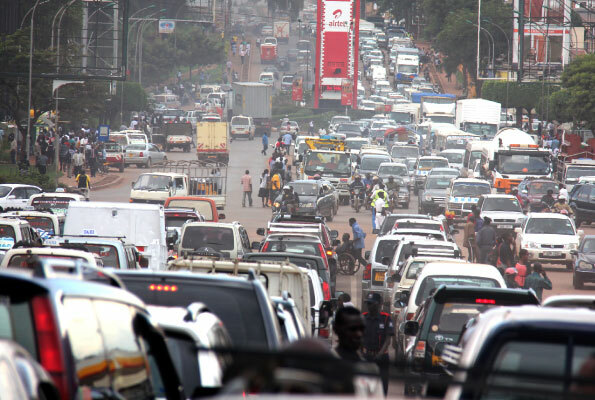 Together with the existing Kampala Northern Bypass the expressway would form a ring road around Kampala City. The project, with an estimated capital cost of $1 billion, will seek a concessionaire to design, build, fi nance, and operate the road as a tolled facility” (PPIAF, 2014). “The project involves the construction of a green field dual carriageway expressway between Kampala and Jinja. The road extends from the boundary of the jurisdiction of the Kampala Capital City Authority (approximately 3 km from the city centre) to Jinja town tying in with the proposed New Nile Bridge. Consequently the nominal length of the project road is about 77km. The existing road, which will remain as a free alternative is a class 1 asphalt paved road in a fairly good condition” (UNRA, 2014). “The Uganda National Roads Authority (UNRA) is the implementing agency for the planned KAMPALA JINJA TOLL EXPRESSWAY. It will link the capital with the important industrial area of Jinja. Past plans have been for four to six lanes for the 77-kilometre road. Cost estimates have also varied from USD 700 million to USD 1 billion. There are reports that the ministry of transport will be floating a USD 1 billion Public-Private-Partnership (PPP) tender and that the International Finance Corporation (IFC) will be the lead financial adviser. Construction could commence in 2015 with commissioning in 2020. COMESA has declared it to be a priority Project that is an important component of the Mombasa-Kampala – Kigali northern corridor” (APA, 2014). Kampala – Jinja Express Highway (Funded under PPP), 77km, Detailed Engineering design completed Construction will be financed under PPP. Transactions Advisor (International Finance Cooperation) is assisting in structuring the project into a bankable PPP Project. 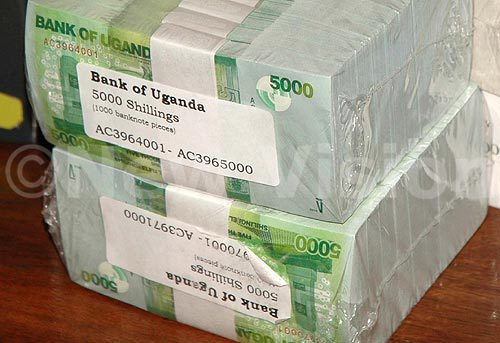 Tendering for financing and implementation is expected in May 2015″ (UNRA, 2015).